This example is based on Inc.5000 Companies data as of 2014. It's a simple project that loads 2 tables from a local database (comes with the example) and a text file, merges them, calculates new column, aggregates data, and exports the result into an Excel report. 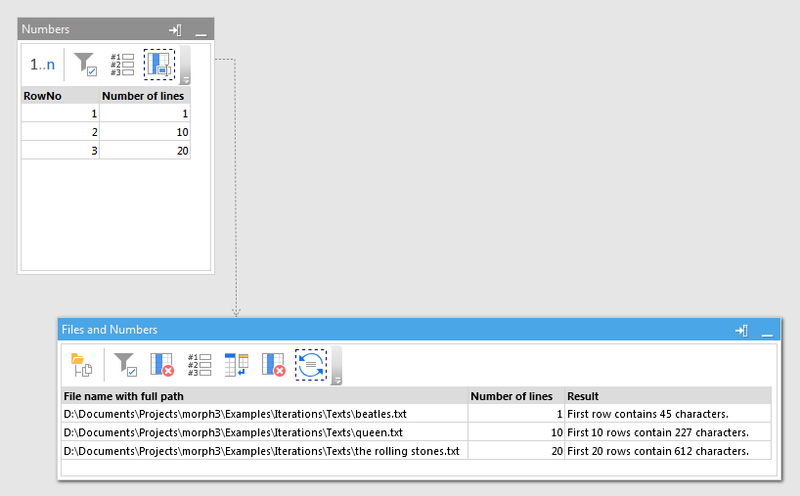 The example demonstrates basic transformations, visual database query, project parameters, expressions, export to file. This project transforms data from the US census of 2012. 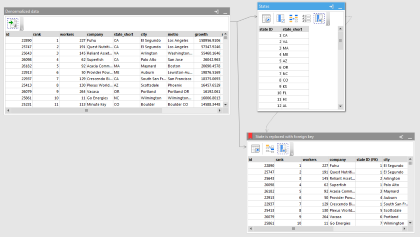 It loads data from a 100MB text file, performs lookups using 3 external tables, filtering and aggregating, and then exports the final result into a Tableau Data Extract. 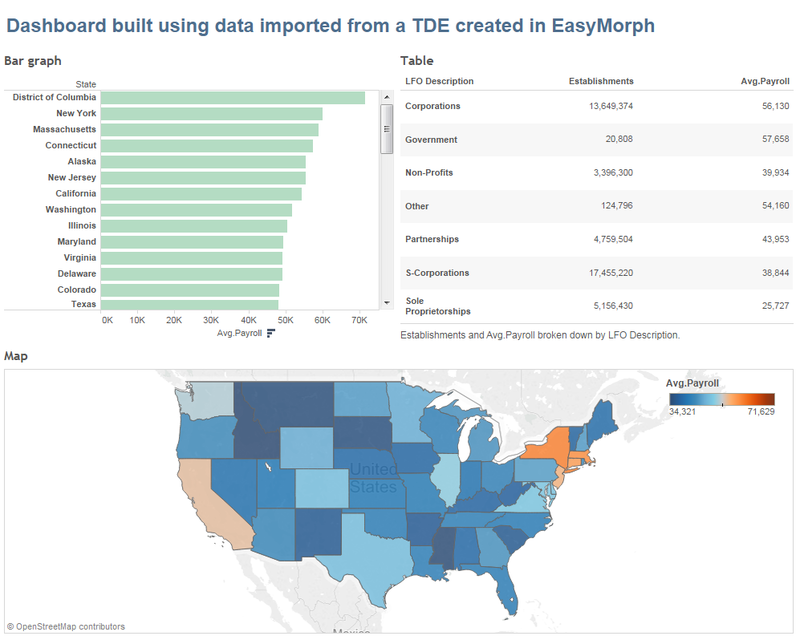 The example also includes a Tableau workbook with dashboard built using the TDE file generated in EasyMorph. 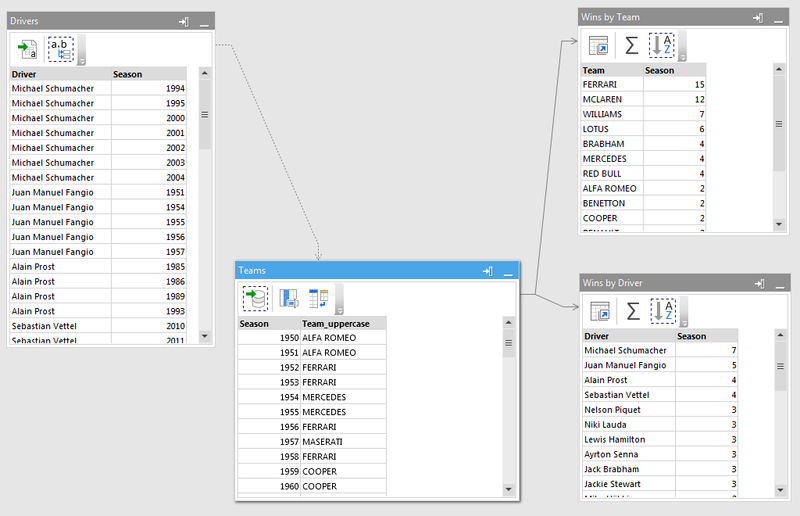 This example shows how to load data from a database using a parametrized query. A sample tiny SQLite database is included so that no additional software installation required — the example works out of the box. This example shows how a data transformation logic can be designed in EasyMorph and then integrated with QlikView (or Qlik Sense). 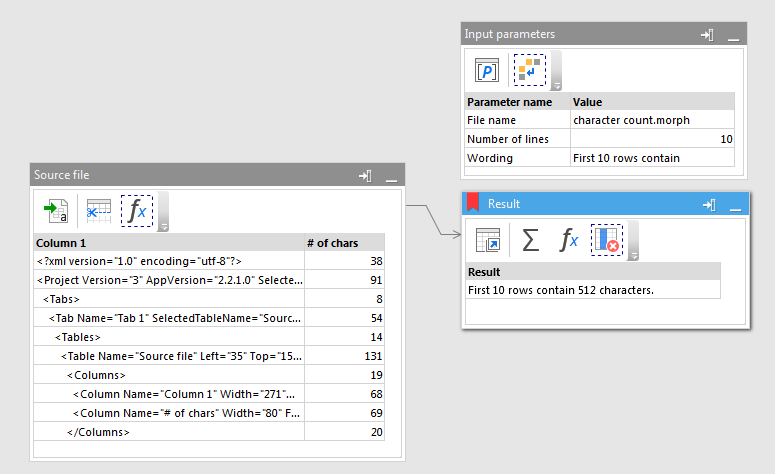 This allows users to see and modify transformation logic in a visual way, without dealing with the loading script. The example also demonstrates QVD file generation by EasyMorph and a way to iterate (process) a list of files. In order to use this example you will need a trial license key. Download trial key. This example demonstrates extracting dimensions and partial normalization of a denormalized dataset. 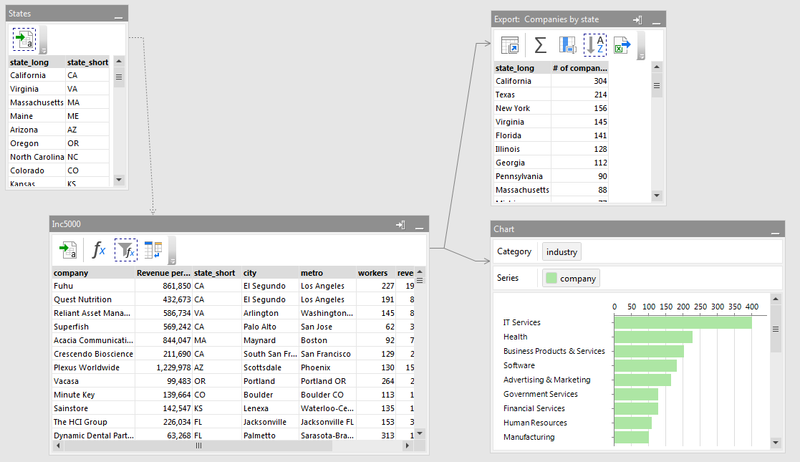 It loads Inc5000 Companies data, creates a new table with a list of states and their primary keys, and finally replaces states in the main dataset with their respective keys. 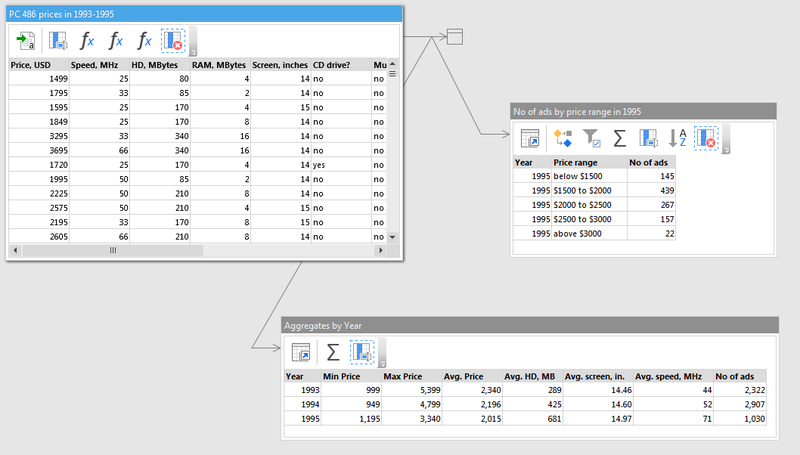 The example is a good demonstration of use of derived tables in EasyMorph. A small project that demonstrates the use of parameters in EasyMorph: transformation properties (e.g. file names) as parameters, calculated parameters, parameters in expressions. The project loads a text file (specified by a project parameter) and then automatically counts number of characters in its first N lines, where N is also a parameter. You can re-run the project multiple times specifying different text files and different number of lines. Examples of various use cases for iterations in EasyMorph. Iterations is a powerful feature that allows arranging loops, processing lists of files, running projects for a range of dates, and re-using logic between different projects. Designed for EasyMorph v3.0 or above. For each recipient on the list it pulls from a database a list of companies in the recipient's state. Then it sends the list to the recipient as an email attachment. 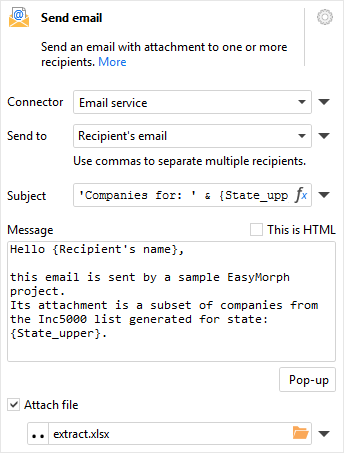 The email's subject and text are customized for the recipient. If the list is empty, the project sends alternative email saying that no companies found for the specified state. Source data: 1 SQLite database, 1 Excel spreadsheet. One main project and one iterated sub-project. Designed for EasyMorph v3.7.1 or above. 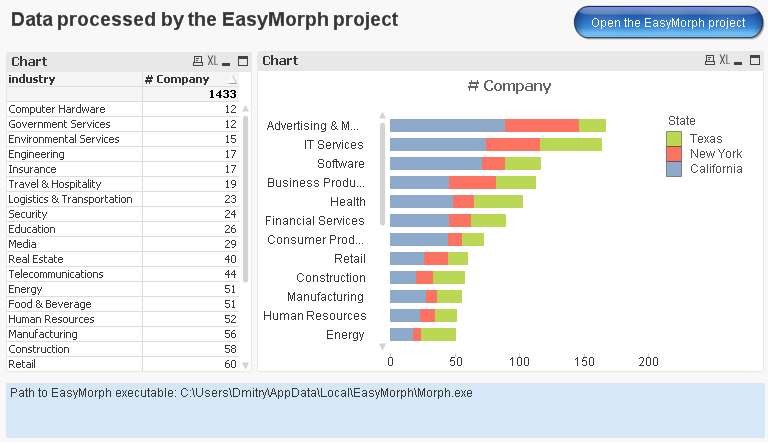 This example demonstrates how data transformation and simple reporting can be done using only EasyMorph and Excel. 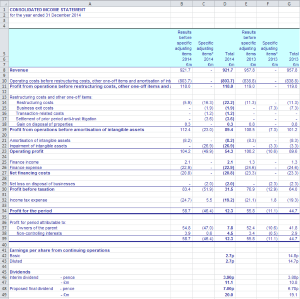 The project extracts data from a complex Excel spreadsheet with income statement of a real public company, and then exports the data into an Excel report with a pivot table and a chart. You can modify the project, run it and see how the Excel report updates automatically when it's re-opened. Experience a bit of nostalgia (or amusement, depending on your age) looking at typical computer specs of 1993-1995 and learn a few advanced techniques in EasyMorph — use of derived tables, self-join and referencing data from previous row. * Run time was estimated on a laptop with Pentium i5 CPU and 16GB RAM.